This "prime pork rind seasoned with Cornish sea salt and chilli" had a familiar warning on the back of the packet; "suitable for those with strong teeth", which made me worry a little for my old gnashers. Having said that, I do have a dentist appointment in a week, but hopefully I won't be giving him too much to do! 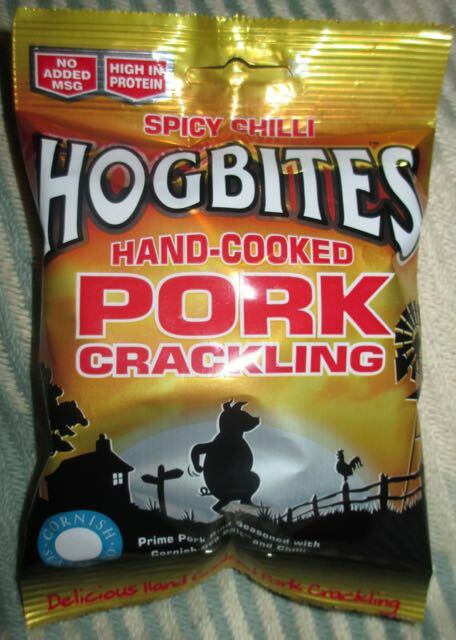 On opening the packet there was a wholesome smell of pork crackling. Cinabar had first bite and said that they were airy and crunchy, which I'd have to agree with. So my teeth could rest easy for now. These pork crackling had a mild chilli spiciness mixed with a light saltiness and were pretty heavy on the garlic. Don't expect many kisses after eating these, but they should go down well with a decent ale without distracting from the flavour. Therefore a perfect pub snack accompaniment to a good ale and shared with some equally good company (because of the garlic). Cheers! 45g packet with 287 calories, 23.4g of fat, 0g of sugar and 0.7g of salt. Ingredients had no added MSG and were high in protein including; pork rind, Cornish sea salt, sea salt, spices, dried bell pepper, dried garlic, dried onion, dried tomato, herb, and rice flour.